Will online labor markets disrupt the traditional BPO firm? Today I spoke on a panel on something called “impact sourcing” at the BPO World Forum. The idea of impact sourcing, in a nutshell, is that online work is a tool for development and that for-profit firms outsourcing some part of their business should look beyond traditional BPO firms and consider non-profits like Samasource and Digital Divide Data. It was a good audience for this pitch, as many of attendees were CIOs from big companies that are accustomed to signing multi-million dollar IT outsourcing deals with the likes of traditional BPO firms like Wipro, Infosys, Tata Consultancy etc. After the panel, I was at a reception where I talked to someone fairly high up in a traditional BPO. When I described my elevator pitch version of oDesk’s business—clients post jobs, contractors make bids, clients make a hire, we intermediate the work and take a percentage—he said, literally “what are you doing here at this conference? You guys are like the Antichrist.” What he meant (in a half joking, half serious way) is that oDesk and similar companies threaten the model of the BPO. My perception is that the traditional BPO model is possible because of two facts: (a) the enormous, purely placed-based differences in wages and (b) the difficulty of actually arbitraging those differences without help. BPOs stand ready to help companies reap the benefits of (a) by giving the help necessitated by (b). The word is still very far away from (a) no longer being true, but if oDesk and similar companies can radically lower the barriers to arbitraging differences by making it easy to hire, manage and pay workers regardless of geography, then (b) starts to become less true. If we get to the point where the qualitative differences of online remote and in-person work diminish and assessing and hiring workers is simple and easy, it would obviate the need for much of what the BPO firm is selling. This is not to say that there isn’t still a huge space for IT consulting—outsourcing an entire process is hard and BPOs with lots of experience have something very valuable to offer. Furthermore, besides purely cost level, one of the motivations for business process outsourcing is ability to change cost structure, namely by turning a fixed cost into a variable cost. But these caveats aside, on the margin, the mediation aspect of the BPO role seems likely to get less attractive over time as technology improves and online labor markets mature. This entry was posted in Uncategorized on June 27, 2012 by johnjhorton. The back story was that I was writing some R code and I got to a point where I was stuck: there was something I wanted to do and I remembered that there was a built-in function that could accomplish my goal. Unfortunately, I couldn’t remember that function’s name. After some fruitless googling, I posted the question on SO. 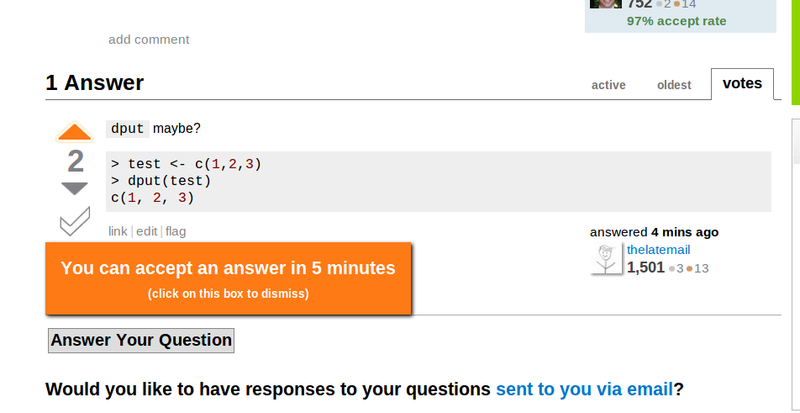 This has been my general experience with SO—amazingly high-quality answers delivered almost immediately. I feel sheepish that I haven’t been able to answer as many questions as I’ve asked, but one of the animating ideas of the community is that asking high-quality, answerable questions is a way of contributing. What’s interesting to me is that SO is an example of a primarily social—as opposed to technological—innovation. There’s nothing really technically innovative about SO: the site is fast, search works well, tagging works well etc., but lots of sites have those things. What’s special about SO is that through a carefully designed system of incentives and policies, they have created a community that is literally—and I think profoundly—changing how people program computers. The reason I point about the social nature of the innovation is that it’s become popular to lament the shallowness or perceived frivolity of many start-ups that are built around social rather than technological innovations (e.g., Facebook, Twitter, Instagram etc.). The idea seems to be that if you aren’t making solar panels or cancer-curing drugs, you’re not doing something socially useful. I personally don’t share that bias, but if we are going to judge companies on the basis of some more “serious” metric like productivity or social surplus, then SO is a great example how a purely social innovation can succeed spectacularly on those metrics. This entry was posted in Uncategorized on June 2, 2012 by johnjhorton.